Working in the Amazon rainforest has its challenges. To name an obvious one, it can be difficult to take equipment into remote field sites in order to conduct research. Fortunately, we live in an exciting time, as technology is rapidly becoming simultaneously cheaper and more portable. 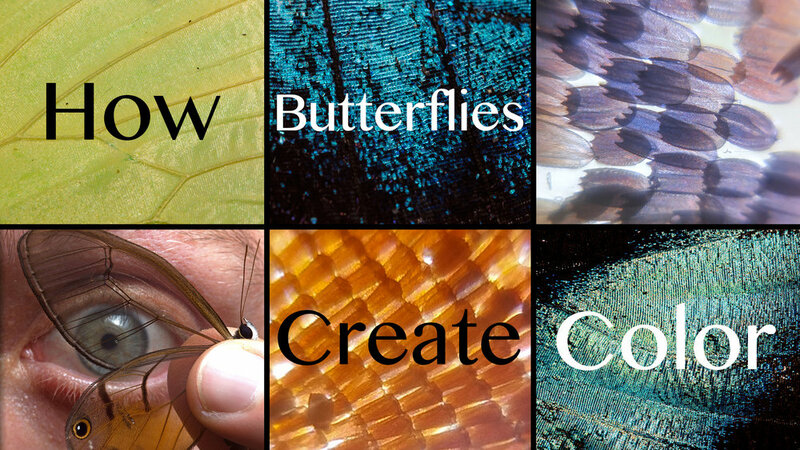 In this post, I want to share a couple tools that I use to document small organisms in the rainforest, including the wing structures of butterflies and moths, as well as discuss the fascinating ways that biology creates color. Macro shot of a Heliconius butterfly wing. The different colors (oranges, yellows, blacks) are caused by pigment production in each individual scale. MP-E65mm, ƒ/11.0, 1/125, ISO 200. For starters, digital SLR cameras and macro lenses are powerful handheld tools that I use to document the biological diversity of tiny creatures that inhabit South America. I'm currently using a Canon 70D camera body equipped with the shockingly powerful MP-E 65 Macro lens. This lens is truly a macro beast, magnifying up to 5 times (aka a magnification ratio of 5:1) and allows me to get sharp images of microscopic structures, such as butterfly wing scales. For shots of the whole organism, I typically use the Canon EF 100mm f/2.8L macro lens, which I really love for its versatility and sharpness. In combination, the 100mm and MP-E 65 are a fantastic combination for macro photography in the field, allowing me to document small organisms such as insects, as well as zoom-in even closer to resolve specific regions. Here's a video explaining how these butterflies create color & using the Foldscope to investigate scale structures. At our remote outpost in Sumaco, Ecuador, tinkering with my camera to photograph insects and butterfly wing scales. s an entomologist in the Amazon, I've been able to study a broad range of fascinating creatures, from Glowing Worms to Tentacled Caterpillars. More recently, I've become enthralled by the wings of butterflies and moths, and more specifically am curious about how these organisms produce such an incredible array of colors. Macro of a Morpho wing, note the blue scales which do not contain any blue pigment. They contain nanostructures that bounce light back at the blue wavelength, a form of 'structural color'. Butterflies and moths belong to the order Lepidoptera and all members have scales covering their bodies and wings (in Latin, lepis means scale and ptera means wing). With over 180,000 described species, the Lepidoptera are not only diverse in their numbers but also in their colors. Their color arises due to the nature of the scales that they produce and can be due to pigmentation as well as structural color. Whatever the origin, color results from an interaction between light and matter. Like beautiful painted tiles, the scales on this Phantom butterfly range from shades of pink to entirely transparent. MP-E65mm, ƒ/11.0, 1/125, ISO 200. Owl Butterflies mating. The large eye spot on the hindwing is thought to startle potential predators like birds, a form of Batesian mimicry in which a harmless organism acquires protection by resembling a threatening animal. But even with the best macro lenses, it's still tough to resolve the scale structures on the wings of these insects. To get really close, we need to get into microscopy. But any of us familiar with using a microscope know that they are big, cumbersome, expensive pieces of equipment - not exactly compatible with field work. However, last year I came across an ingenious invention by a lab at Stanford, the Foldscope (an origami foldable microscope that costs about one dollar). Some of the tools in my "mobile lab" kit: a foldable microscope, a DSLR camera with macro lens, a handheld gene sequencer, and my mobile phone. In the past I've posted about using the Foldscope to investigate small critters in the Amazon, but I've recently started using it to look at butterfly and moth wing scales, and it actually does a fantastic job. An Amber Phantom butterfly with transparent wings. Combining macro photography and the Foldscope, allowing us to see the different scale structures that make up the colored and transparent regions of the wing. Here is a dirunal moth in the family Uraniidae, notice how the scales that appeared green shift to a violet/purple color under the Foldscope. I imagine that the colored scales have microstructures that produce green wavelengths under normal sunlight conditions and changing the incoming light in the microscope has shifted the wavelength output. This is the reason Morpho butterflies appear iridescent blue, due to the structure of their nanoscales (called mullions). Compilation of butterfly wing scales through macro photography and Foldscope microscopy, all taken while in the field in the Amazon Rainforest. Hope you enjoyed, you can check out more updates via Twitter, Instagram, and YouTube!